Imagine being a student here and your residence having these spectacular views over Clear Water Bay, and even if you are located at the back of the building, this is what greets you…. Which is not so bad! Hong Kong University of Science and Technology is a very young university which celebrated it’s 20th Anniversary in November 2011. The entrance to the University Main Library is from this large atrium area, and leads directly into the large open area used for exhibitions and other events. When I arrived it was set up ready for a “book talk” later I the afternoon. Entry into the library is simple, there is no need for University ID, this is because this is a publically funded University and it is open and available to the local community. However, the University is approximately 3 miles from the local town, so although the local community does use the library, they are not usually inundated by visitors. Unlike the stream of visitors to the new learning commons that they have hosted since it opened in February 2012 and they have a busy schedule of visitors to come. With all this interest in the new learning commons, it was wonderful to be hosted by the Learning Commons Manager and the Library IT and Infrastructure Manager who were not only enthusiastic about the library and its facilities, but seemed particularly delighted to have another opportunity to show me around and discuss every detail. They were happy to answer questions they must have answered many times previously, patiently and with very good humour! We started the tour on the ground floor , discussing first the digital “e-board” digital signage system they were running via large kiosks and screens throughout the library. Again, the students were revising for examinations, there was one week of exams left, so revision was intense and we were keen to disturb the students as little as possible. 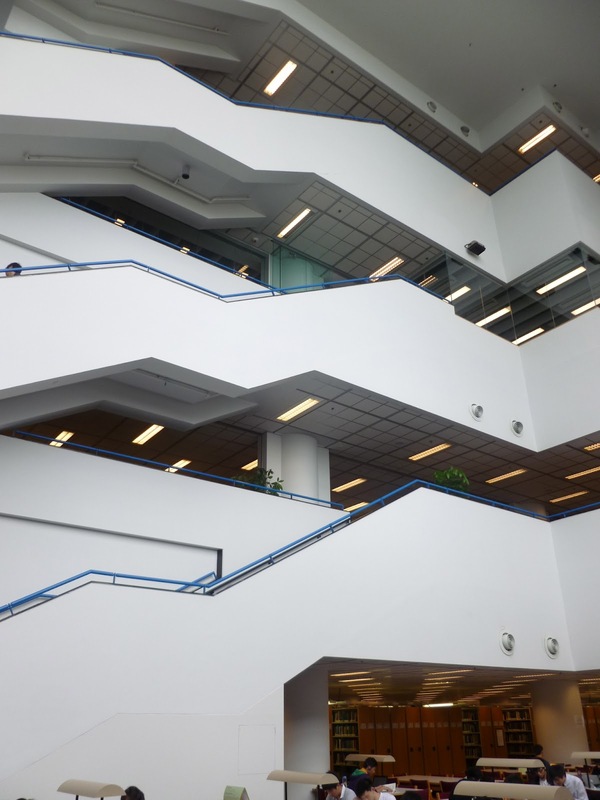 A large area of this floor is dedicated to the Information Commons, an area created in 2007 to combine the ability to study, research and collaborate and which was the precursor to the new Learning Commons. It is an area full of computers with a wide variety of furniture layouts. The Library have plans to increase PC provision on these tables 2 per side, doubling provision and improving the range of facilities for students. The building is a half circle shape, and on every floor the light and the views from the full height windows was fantastic. Towards the back of the Information commons was an area of traditional study tables, but with power retrofitted to enable use with laptops and other mobile devices. 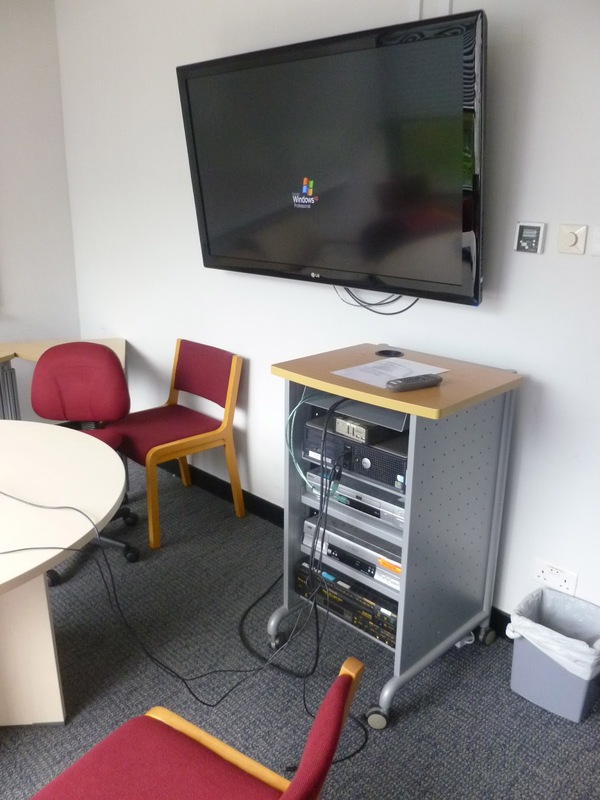 Because of limited funding, the library has worked hard to reuse and recycle furniture to ensure that the students have plenty of access to facilities including power which has been installed retrospectively. So, although not all facilities are brand new, they are good quality, sound and completely fit for purpose. We then moved to the first floor, which is actually the top floor of this 5 storey building, as the library is constructed on a hillside. Each of the floors has access to a study deck, where students can work outside. Some furniture has been built into the deck, and other patio type furniture for group work has been provided. Furniture needs to be robust as this area is subject to typhoons, so heavy furniture reduces the risk of it being blown about! Before going to look at the Learning Commons, we visited the other 2 floors, both Lower Ground, but with wonderful views and light. 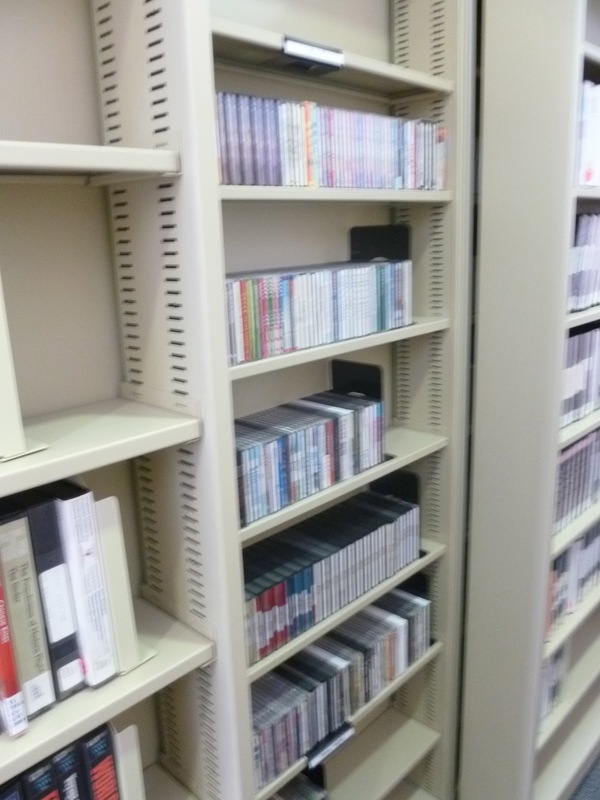 On Lower Ground 3 is a vast multi-media collection housed in compact shelving in addition to a large proportion of the approximately 750,000 volumes held by the library. It was in this area that we saw the first of 40 group study rooms located in and managed by Library staff. The new learning commons is located on Lower Ground Floor 1 because it can be completely isolated from the main library and opened 24/7. The out of hours access is located by the Student’s Union. The facility took 2 years to plan and complete, led by the University Librarian and assisted by an Architect who worked closely with the Library Team. The Learning Commons occupies 1800 square metres of space with approximately 500 seats. In order to create the space, over 80,000 books and resources were moved into “off site” storage. This compact area consists of 17 group study rooms of various sizes and an ideas corner. The design of the space cleverly “loses” the columns that we find in many buildings and which can be difficult obstacles to include and adapt in designs. The ideas corner is a small open space where students can work with a touch screen PC or writing board, and unlike the study spaces, is not bookable. It is also a quiet space to work away from the main study area. This zone consists of three rooms. 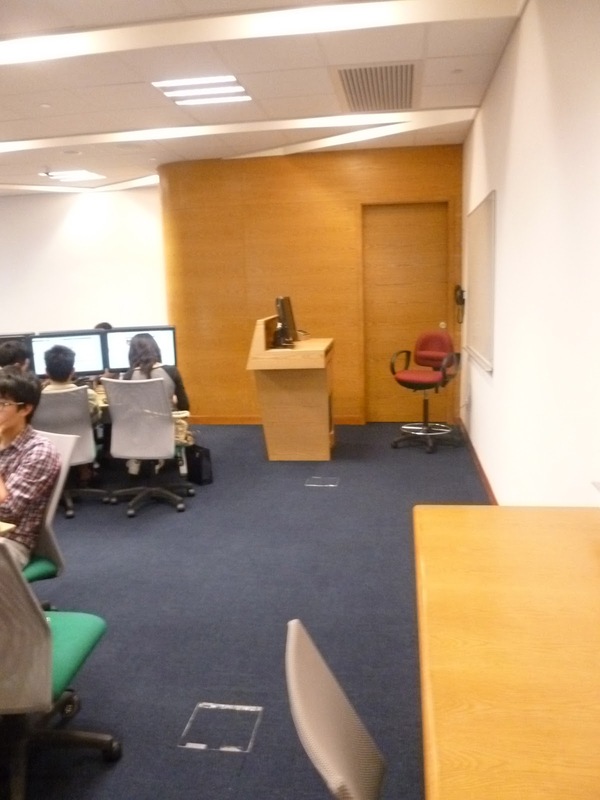 The other two rooms are IT Training rooms that double up as open access study spaces when not in use for training. There is a fully sound proofed partition wall that can be opened to create a single training room. I am getting used to seeing media production studios with associated accommodation located within university Libraries, and here is no exception. This small facility includes a fully equipped studio, AV control room, 4 AV Editing Suites a Graphics workshop and a service counter. Students can produce work here and experienced library staff are on hand to provide assistance and support. 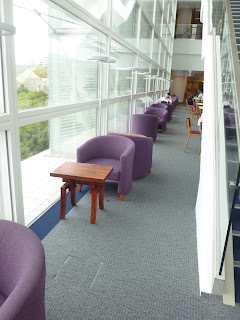 This area has been set up behind a neat glass screen in order to ensure that food and drink does not spill out into the main area, and that the noisier activity in here does not disturb other students. Running through the centre of the other zones is the open Study Zone. This is an area providing tables with power for students to work individually and in groups. Chairs on wheels with writing tablets for laptops etc. Evaluation of the space and facilities is now ongoing and it will be interesting to see how the space is used and how it influences the evolution of the Main Library generally. Toni. I remember see this building whilst I was in HK last November, but didnt realise at that time what it was. I agree views are fabulous along this stretech of the HK coastline, although the shark nets are a little off putting. What a place to study though, quite relaxing and i am guess even more fabulous when the sun is setting over the South China Sea with all the Junks sailing by? Ooooh, sounds delightful, but no-one mentioned the shark nets!! Yes, definitely afternoon visits are much better than the early morning to get a proper feel for how the students are using the spaces. And these were certainly engaged!